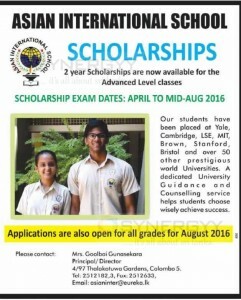 Asian International School, leading school in Colombo offers 2 year Scholarships for the Advanced Level classes. The scholarship exam dates: April to mid-Aug 2016. Our students have been placed at Yale, Cambridge, LSE, MIT, Brown, Stanford, Bristol and over 50 other prestigious world Universities. A dedicated University Guidance and Counselling service helps students choose wisely achieve success. Applications are also open for all grades for August 2016. For more details contact to Mrs. Goolbai Gunasekara (Principal/ Director) # 4/97 Thalakotuwa Gardens, Colombo 5.